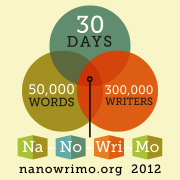 NaNoWriMo begins tomorrow. I’m giving myself time to that sleep and then wake up although I’m pretty nervous and excited. This month (October), I had intended to do absolutely nothing except maybe edit. It didn’t work out that way. I actually ended up writing three crappy stories, and I hit across one story I’d like to delve into more deeply. Let me just say that finishing anything, even if very rough, feels amazing. One of the greatest fears I have is that I won’t be able to finish because I’m not a real writer. I’ll just let the story fizzle out and become frustrated when I can’t connect the beginning and the end. I went to the first meet up last week, and it made me realize that this is exactly what NaNo is about for me. This fear usually sits in the back of my head where I ignore it because, duh, we all feel this way when we commit ourselves to a story. But NaNo puts the pressure on. It forces that fear out of hiding and puts it front and center where I have to face it. So far suggestions have been to tell people that a novel is being written so that people in your life will help hold you accountable, but I don’t think that’ll work for me. This is a battle with myself. Luckily, I have left over confidence from my intended month of rest all because I managed to finish a couple of really questionable stories. That’s the power of just doing. I’ve see that it can be done, and now I just have to do it with a larger story over a longer period of time. That’s all. So on this day before NaNo, and I just want to wish everyone a happy month. Even if you don’t hit your goal, or even if your story is crap, just keep going. The reward is really worth it. The local NaNoWrimo chapter is holding a meet and greet on Monday. They’ll do local write-ins during November. I’ve never actually gone to one of these write-ins, though I was very curious. Part of it was because I couldn’t make the meet-ups, but most of it was because it meant having to meet writers in real life. I’m so used to writers being someone on the computer screen. Your face is just a picture next to your twitter name/bio to me. What I meet are a writer’s words, and I learn a lot from those words. Despite the importance of book covers and author pictures, I really judge a writer on what they say. (I’m actually very picky, friends! I don’t just friend people because they also happen to write. /snob) The internet is our medium, we live our words and put ourselves forward with them. Some of my best friends have never even heard my voice! But they know me better than many people who actually meet me and have a chat with me. The other thing about write-ins for me is that they’re just a distraction. How in the world would anyone get any writing done as a group and in public? I don’t think I would. Maybe their furor would help? It might be an interesting group dynamic. Anything can happen when people get together. So, though I’m nervous, I just might go. Yes, this year, I’m doing NaNo. My intent is to knock out the next rough draft of a story that’s been on my mind for a year now. I need to learn how to write out rough drafts faster, especially if I want to spend more time editing. My current plan is to write up a basic outline, and then each day in November that I sit down to write, I’m going to write out what I intend to do that day. Sort of the same way I do already when I get stuck on something. I put down my intent with the scene so that I can see it clearer. Anyone else doing NaNo this year? Ever go to a local meet up? It’s not a good thing for a writer to brag. Or at least not good for this writer to brag because fate aims to keep me humble. But I feel as if I’ve made great strides recently and actually gotten a lot done. It’s too good a feeling not to share. Since I’ve managed to come back, I’ve finished one short story and today I’m going to say I’ve finished another novella. I’m going to say I’ve finished, because it’s about as done a rough draft can be. Now it’s a matter of cleaning it up, tying things together, and making it all make sense. There were a lot of things in the rough draft I didn’t plan for but worked out perfectly. I may not know what’s always going on, but my subconscious seems to have a plan at least. It’s been nearly a year since I put out my last book, one which hardly counts because it was a novella companion to Ruin, meant to offer an alternate view point of the world. I have to admit that I feel like I have failed in some way. I’d definitely planned to have more than just one book out this year. I can’t completely blame real life. I can’t blame writer’s block either. I can’t really blame any one factor. The truth is that I’m still getting a hang of everything– not just the self-publishing, but the whole act of writing something and then working hard to make it polished. I’m not just writing straightforward stories. I’m always trying to push myself in small ways. I’m still learning what I can get away with in book format. Sometimes, I feel like I’m a real writer, doing writerly things and experimenting with ways to tell my stories. Most of the time though, I feel like a sham. That’s what I let stop me cold. I’ve always suffered with self-esteem issues. (I know many people do.) And sometimes I let them get the best of me. I think I stopped writing in April. I just didn’t feel I could. So I took a week off. Then two. Then a month. Then bad stuff happened that had no relation to my writing. Here’s what I’m learning: Even when I don’t want to write, I need to write or else I let the dark part of me triumph. I haven’t quite learned how to make myself do it other than sitting down in front of the computer or on my notepad and just doing it. I have all sorts of simple ways to trick myself into writing. Ultimately, it always comes down to just taking the time to face my fears and get to work. So this weekend, my niece and I headed out to get her senior portrait. It was just the two of us. She wanted a simple portrait by the “river.” I had known about it for a week, so I tried to psych myself up to take portraits as well while we were out there. I hadn’t said anything to my niece about it (probably wanting to give myself an out), but she brought it up in the car so I had to go through with it. Not surprisingly, all my pictures came out awful. Even my niece couldn’t lie. She was nice about it, and there were some pictures that weren’t that bad, but they weren’t exactly good. I knew they were coming, and I tensed up each time. She had me look away from the camera, and I still felt uncomfortable. So her solution? 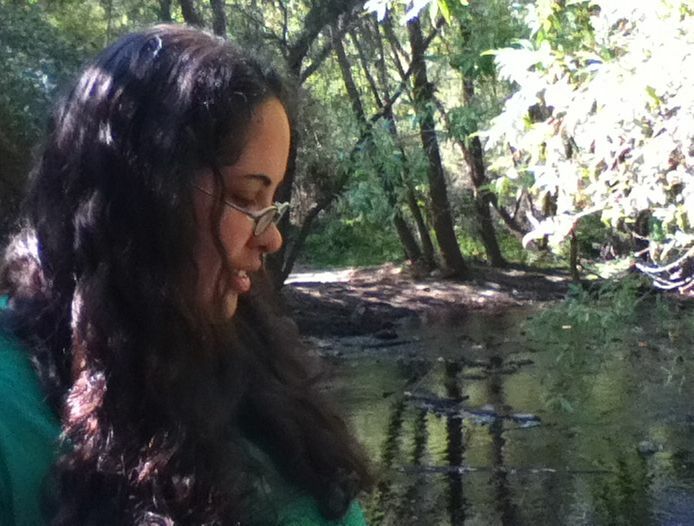 She snapped a shot of me on the sly with her ipod. So that’s how it happened. I got my “author picture.” I’ve been honest before about how I’ve taken myself out of the marketing of my book and I’m instead focusing on the story and that world. (At least what little marketing I’ve done.) Mostly because I’m so uncomfortable with images of myself. There is no one size fits all to marketing or managing a career. I’m not really telling you all this so much as reminding myself, something I find helpful from time to time. When I was younger, writing was something I did with my weekends. (Honestly, I had no social life.) It was basically something I did when inspiration hit. That is not to say it’s something I regret. I learned a lot from play writing. I used to say I wanted to be a writer, but I eventually learned that at that point in my life, I just wanted to write. It shows in the stuff I worked on. They meander. There’s no beginning or end. I never finished a story because I never had one to finish. But I was laying the groundwork for the stuff I’m writing today. Recently, I’ve made more of a push to write daily on a focused project. This is something I was doing before, kind of, only now I’m more conscious of it. I can write whatever I’d like but unless I write some words on my intended project, it doesn’t count. It means that at some point, I’m going to have to seek quiet time and add some words. You know, I’ve discovered that I don’t like first drafting! At least not when I have a goal in mind. It’s not the plotting things out that’s the problem. It’s just the act of getting this shaped story out of my head. Often it sounds so good in there and then so good on paper when I write out my plan. Then I get to actually writing the thing, and I hate it. Problems crop up, and I have to find a way to push on through until I can get to the end. I’ll be honest, I do some editing as I go. That might be part of the problem. I’m not a great planner, so sometimes ideas occur to me while I’m writing and then I have to fix it to carry on. It doesn’t always mean abandoning whole bits of story, but sometimes things will require a realigning which is dangerous work itself. I still love play writing. Those are the stories that crop up out of nowhere and probably have nowhere to go. They’re still fun. I don’t consider those first drafts because I rarely intend to get anywhere with them. I think they just serve as a nice break from focused writing. As for writing daily, whether inspired or not, I have to say it’s working. If I miss a day, there is no catch up day. I need to seize each day for the precious commodity it is. I do try to ease into the writing daily by working on blog posts or play stories. I make a deal that at some particular point (usually 4pm for me), I will sit down and write on the project. It’s been a little bit of a fight lately. That’s why this post is late and I haven’t spent too much time online. But it’s been getting done. Last night, I sat down and wrote before bed, adding something like 1,000 crappy words which may help me get past a difficult part. My intent is to have a first draft soon. I’m almost there. I have a lot of work ahead.